Precious Prill Water is super-hydrating, and is a far superior moisturizer to common water. It will enhance your nutrient absorption & toxin elimination, and this will improve your health. It has increased oxidation-reduction potential, lower surface tension, and higher pH than the water you treat, to help reduce the damage from free radicals in your body. Prill Water has increased potential to raise your body's pH. Prill Beads are an all-natural organic energy enhanced water purifier and re-conditioner that restructures drinking water on a cellular level to fully refresh, hydrate and revive the body. The human body is mostly water; newborns babies are 95% water, adults are 75%, and elders are 65%. Clinical studies prove that the quality of water one consumes directly affects the status of physical state. Prill works by both altering water's surface tension and chemical bonding to remove heavy metals and toxins ingested from water supplies, household and industrial chemicals, and food pesticides and additives. As an elixir, Prill’s super hydrating waters flush toxins in cell structures. The Prill Water is thin water that rehydrates and rejuvenates your cells. 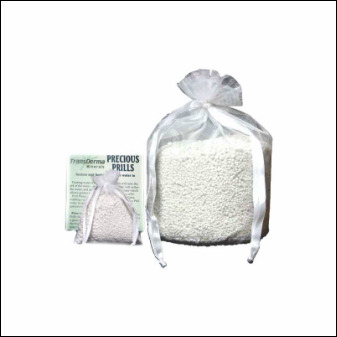 Precious Prills are made of magnesium oxide. The Prill Beads are further energetically enhanced with a proprietary energizing process. Originally created to clean up nuclear waste, they are from a new technology that allows anyone to make very fine "vital water" from virtually any source. This water measurably hydrates the body and has a favorable oxidation reduction potential (reduces free radicals in the body). Prill Water can be used anywhere and any way that common water is used. Some people notice a thirst for a day or so until enough of the body's water is replaced with this vital, thinner water. It also balances the pH of water to make it more useful for the body. Precious Prills are not meant to be a water purification device, but because the water does not support lower life forms such as germs, bacteria or fungi, it does not need to be sterilized. Most of the pain in our bodies can easily be tracked to a shortage of moisture, called "dehydration". Prill Water has the power to reduce pain and thus reduce the stress caused by the pain. It is a wonderfully moisturizing liquid. Placing common water in contact with Precious Prills causes a remarkable thinning of that water. The resultant liquid is known in nature as Dew. It is much thinner than common water, and tissues absorb it, both the moist internal tissues, and the somewhat drier tissues (skin) found on the outside of your body. Living cells that are properly hydrated have excellent dynamics, while under-hydrated cells, or perhaps even worse, over-inflated cells are extremely vulnerable to toxins and disease. Proper liquid stasis relates directly to cellular longevity, and cellular longevity relates directly to health and vitality. We believe that all natural water is more than H20 - two atoms of hydrogen and one atom of oxygen. There is something else which enables water to change its structure. We have evidence that this "something else" is ORMUS. There is good evidence that the ORMUS elements are particularly abundant in magnesium chloride, the active ingredient in our products. Initially use Prill Water moderately and slowly increase. Drink a glass the first day, two glasses the second day, etc. until your body is able to handle a full two quarts daily. This allows the body to adjust and flush the toxic build-up in a manner that is tolerable by the user. After the first month or so, decrease use and drink intuitively in moderation on an ‘as need to use’ basis in order to flush new toxin exposures. Drinkers of super hydrating Prill Water report feeling alive and refreshed with clarity of thought and strength of mobility. Please remember, these last a lifetime - so it is a one-time purchase. Those who regularly buy gallons of spring water or bottled water of any kind will save hundreds or thousands. In addition, you receive the awesome Prill water health cleansing and cell renewal benefits. Refill the container with water. In an hour you can pour off 3 quarts (3 liters) of Prill Water and continue every hour - from this day on - the rest of your life - for use as you need it. Prill Water detoxifies your body - so start with small amounts and build up to where you can drink two to four liters (quarts) - daily. NOTE: Refrigeration is not required. If the water is not used within a few weeks, a metallic taste may be noticeable. Empty the container and begin the curing process once again. Variation in Prill color is normal and part of the manufacturing process. If there is disharmony in the environment, the Prill water can, all of a sudden, taste off. In this case, it is reflecting the environment, and it is appropriate that you take the Prill Beads out of the water container, wash for 10 minutes or so and then start the whole procedure again. Prill Water cannot be contaminated. It cleans up contamination. It keeps on working no matter where it is. As we use it, we begin to clean up the water of the world - one person, one septic tank, one sewer system, one lake and river at a time. Drinking Prill Water can begin some of the detoxification process, and by the time you spend a minimum of one month on the water, you'll be more balanced than you were before you started. The Prills work in any water. Some tap water is quite horrible and takes longer for the process to complete. The better the water quality that you begin with, the better your resulting Prill Water will be. Put 2 gallons of Prill water in a bathtub, then fill with hot tap water for an exquisite rejuvenating soak. When drained, the waste water goes into the process of transforming the water in your area. Place the Bath Prills in your bath as you are filling your tub. Keep it in your hot tub for extended time to create a super-hydrating experience. Breathing Prill Water vapor helps people with a sinus or lung problem. It repels black mold, and helps eliminate odors, creating a healthier indoor environment. Twilight America's Crystal Cupcake or Pearl would be more effective in this application. Clean and/or marinate fruits & vegetables to enhance flavor, raw or juiced. In the toilet tank to help clean septic systems (may corrode plastic or metal over long periods of time). To restore your Prills to clear and white, simply immerse the whole bag in Hydrogen Peroxide 3% (pharmacy grade), or full strength vinegar. Rinse thoroughly, and start over. Over time, some people have seen their Prills change color, either from algae growth (stronger when exposed to sunlight) or mineral buildup (from hard water). The color does not affect the functioning of the Prills. We have seen gray, beige, orange, blue and green, depending on the water source (calcium, magnesium, iron, copper, etc.). Energize and structure your water to super-hydrate your body, pets and plants. Enhance your nutrient absorption and toxin elimination. And greatly reduce chlorine! Energetically enhanced magnesium oxide pellets in a nylon organza pouch.